Why do we eat bibingka and puto bumbong every Christmas? Local culinary icon Glenda Barretto remembers stepping out of the Misa de Gallo on Christmas Eve and breathing in the aroma of bibingka (fluffy cake made of glutinous galapong rice) and puto bumbong (made from steamed pirurutong rice variety) from stalls gathered in front of their parish church in Samar province. She calls it a “memory that I hold near and dear” from her childhood. After the mass heralding the birth of Jesus, her parents made it a tradition to purchase bibingka—still steaming-hot while wrapped in banana leaf—and hurry home with the children. The family would then consume the rice cakes with freshly-made hot chocolate in the kitchen. “It was something we looked forward to,” she said. Despite the passage of time, Barretto still loves bibingka for its taste and the memories it triggers. “I love bibingka! I can consume (one) entirely and it is a whole meal by itself,” she said. Barretto also likes puto bumbong but considers it a dessert after a light meal. Bibingka and puto bumbong are just two among kakanin offered throughout the country. Chef Gene Gonzalez noted in The Little Kakanin Book that the word stems from “kanin” that can either be used as a noun or as a verb. “With the prefix ‘ka,’ kakanin describes many kinds of rice recipes meant to be eaten as snacks and of the many ways of cooking snacks or desserts to celebrate the harvest of the Philippine islands,” Gonzalez said. But among all the kakanin, only bibingka and puto bumbong enjoy an enduring connection to the Filipino holiday season. There is, of course, an interesting back story. Back in the Spanish colonial period, the friars introduced Simbang Gabi—the nine-day set of novena masses celebrated at dawn beginning Dec. 16 to usher Christmas. The masses conclude late on Christmas Eve with the Misa de Gallo or Rooster’s Mass that supposedly ends at midnight. It is believed that anything prayed for while attending the nine masses would be granted. That the nine-day Simbang Gabi masses are held sometime between 3 a.m. and 5 a.m. is supposedly a “compromise” between friars and farmers who needed to tend to their crops before sunrise. “With Simbang Gabi season came longer work days for our forefathers—waking up to attend the masses [meant] waking up before the break of dawn,” Barretto explained. And to prepare for the work ahead after the mass, the farmers would proceed to the stalls selling various kakanin in the churchyard for carbo-loading. 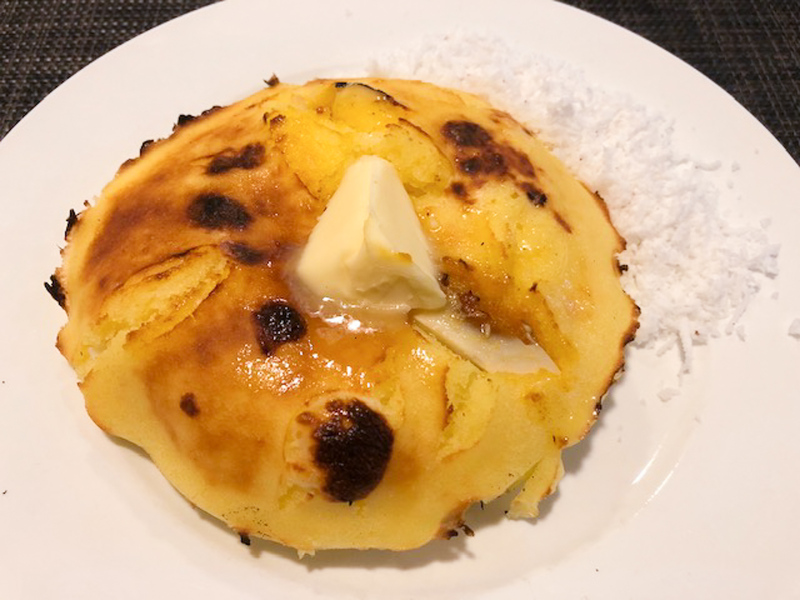 “Less of a festivity and more of a functionality, our favorite bibingka and puto bumbong were rooted in the need for a heavy breakfast [farmers] could easily consume after the [Simbang Gabi],” she added. Still, preparing bibingka and puto bumbong is laborious. To make bibingka, glutinous rice called galapong is soaked overnight either in water or coconut milk inside a clay jar and sprinkled with yeast. Hours later, the galapong is ground into a thick paste and mixed with eggs and milk before it is cooked. 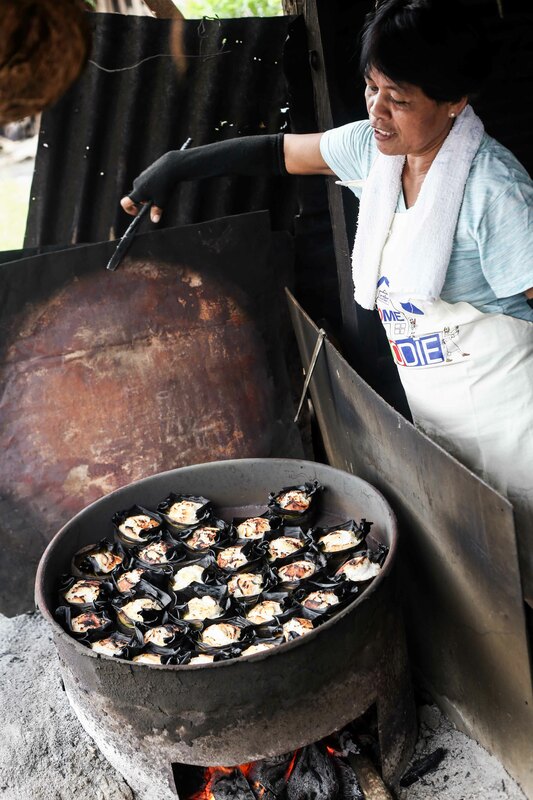 Chef Rolando Laudico describes the process of making bibingka: “The rice cake is cooked in a native clay pot lined with banana leaves, with hot charcoal both on top and bottom as heat source. “Some versions, especially those (now) commonly prepared in big cities, are fluffier and taste more like cake. In rural areas, the bibingka is usually flatter but very rich, almost like a pudding or custard,” Laudico said. 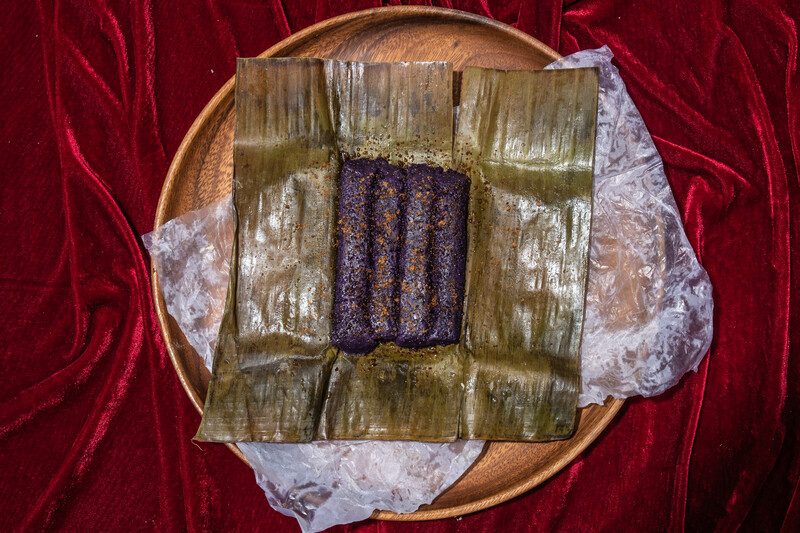 Inquirer food writer Norma Chikiamco said banana leaves play a significant role in bibingka. These are not just food wrappers. 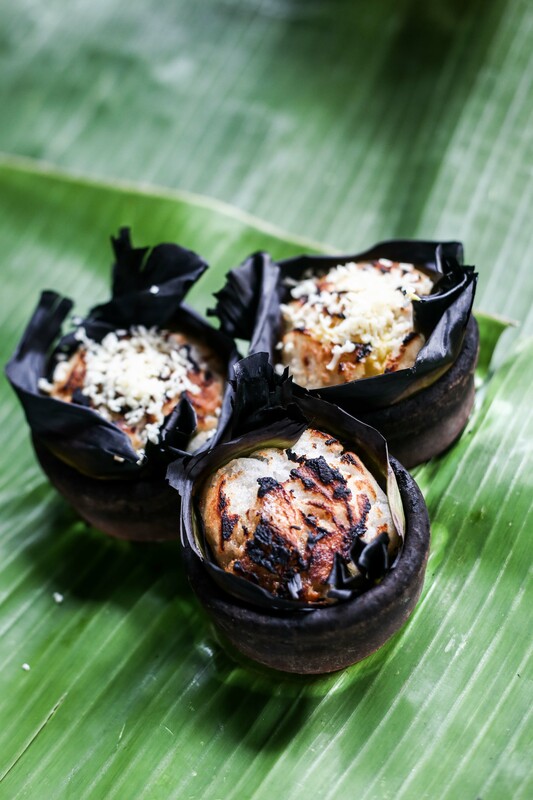 Enveloping fresh bibingka in banana leaf ensures the inclusion of the leaf’s subtle aroma into the kakanin. 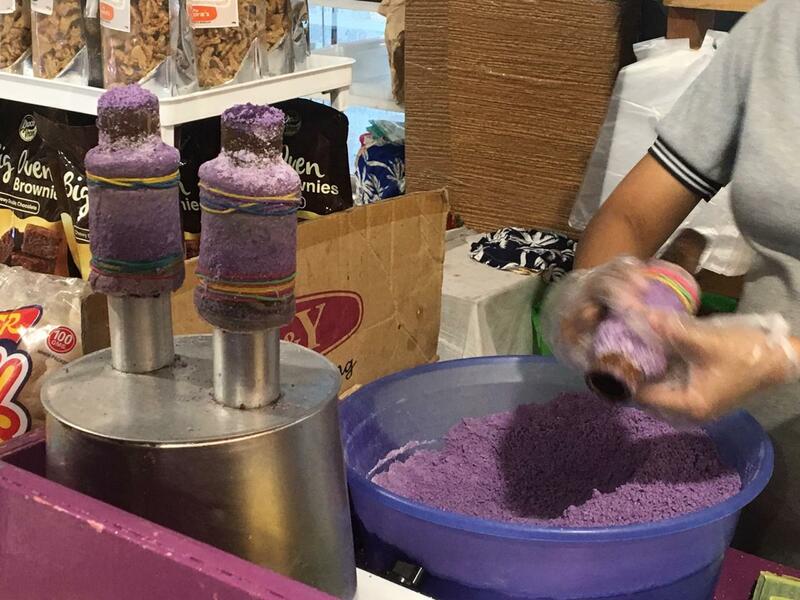 Making puto bumbong begins with soaking the purple-hued pirurutong glutinous rice in water overnight. A white rice variety called “malagkit” is sometimes added for chewiness. The following morning, the pirurutong-malagkit mix is pushed into the bamboo tubes, inserted into metal cylinders or steamers lubricated with cooking oil, butter or margarine. Once cooked, the puto bumbong “is laid on a banana leaf and spread with butter or margarine, rolled on muscovado sugar and sprinkled with freshly grated coconut,” the food dictionary said. Like bibingka, puto bumbong is best eaten piping hot. 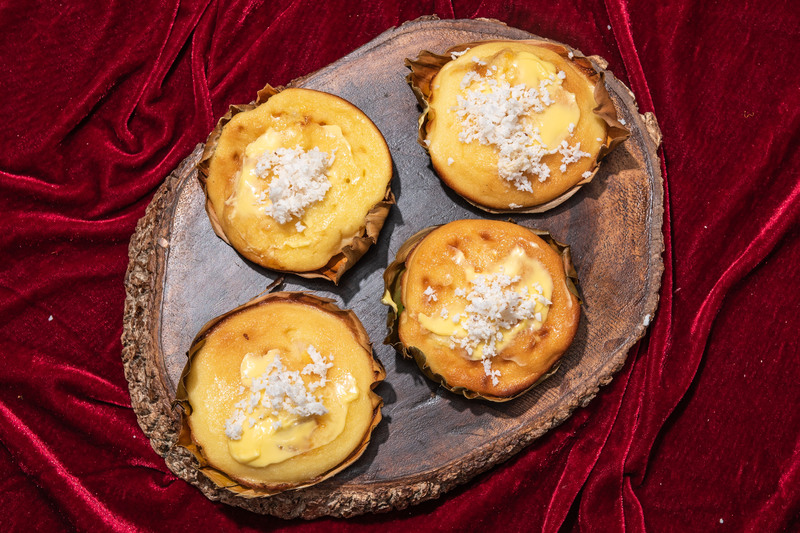 Casual diners usually regard puto bumbong as second fiddle to bibingka. The Maya Kitchen begs to disagree, noting its unique qualities. In the book Sarap Pinoy: Mga Lutuing Pilipino, The Maya Kitchen noted that unlike bibingka that is baked, puto bumbong is steamed. 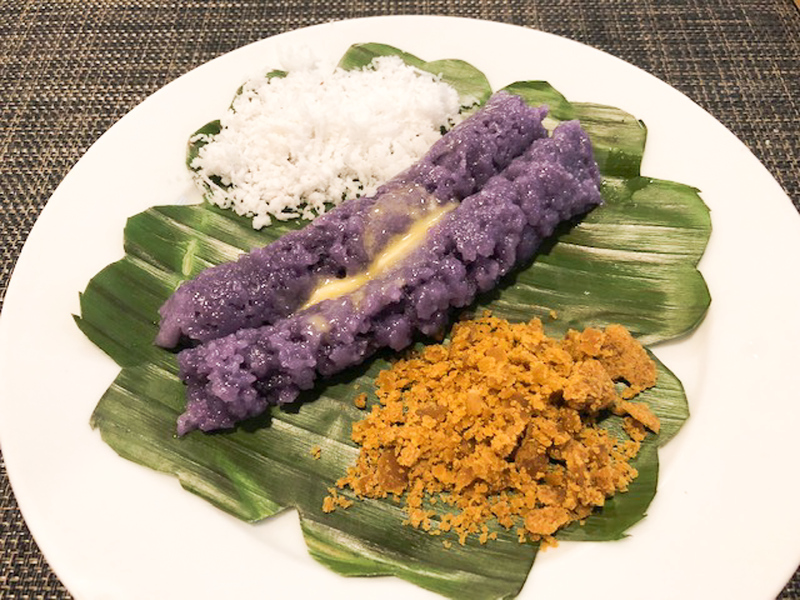 The Maya Kitchen also pointed out that puto bumbong looks more like suman, another kakanin also noted for its stickiness and porousness, instead of traditional rice cakes. Barretto noted that the two kakanin were initially downed with salabat or ginger tea by the Spanish era farmers after the mass. “The introduction of hot chocolate came much later when the Spaniards adopted the practice,” she pointed out. True enough, the Philippine Food, Cooking and Dining Dictionary lists about a dozen bibingka incarnations from different parts of the country: There is bibingka buko from Davao del Sur; Cebu’s bibingka pinalutaw is made to float in boiling water instead of steaming; bibingka royal from Ilocos has white sugar and grated cheese; bibingka sa mohon by the Ilonggo is oven-baked. Cavite’s bibingka samala looks more like biko because of whole malagkit or pinipig grains; bibingkang abnoy or bibingkang mabantot from Pateros and Pasig uses the sulphur-smelling portion of rotten duck eggs for that trademark aroma and is garnished with lots of pepper. 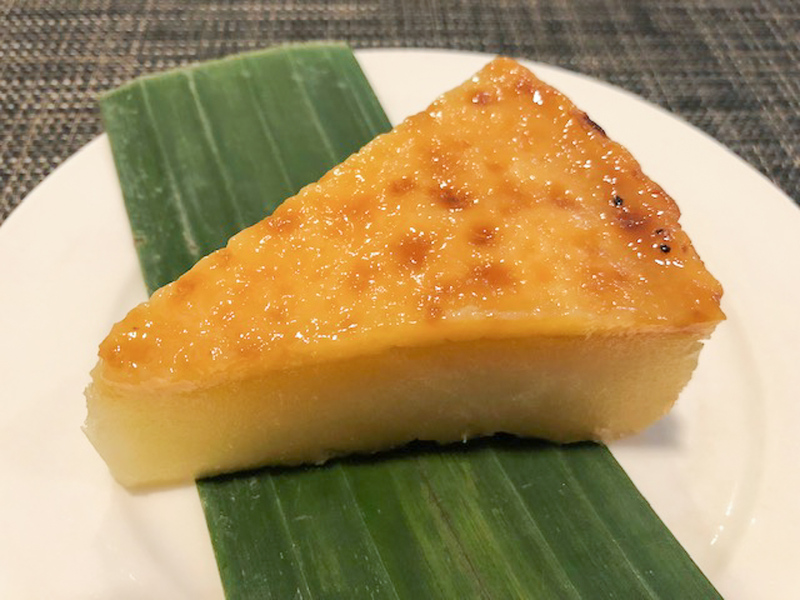 Bibingka cassava is just one of the more-than-a-dozen incarnations of the original holiday fare, proof of how extra Pinoys are when it comes to food. Bibingkang cassava is a popular kakanin topped with custard; bibingkang galapong like what Barretto serves has salted egg and kesong puti; bibingkang hiponis actually a shrimp fritter. Bibingkang malagkit wades in sweet coconut milk; bibingkang munggo from Bulacan features mung beans; bibingkang nasi from Pampanga has to be cooked in a molding pan while bibingkang pinipig is sprinkled with, what else, fresh pinipig. “Wherever or however it is prepared, the bibingka is decidedly delectable,” Laudico said. Bibingka and puto bumbong are not simply entrees on our holiday table. They also tell the story of Pinoy resilience, faith, and creativity.